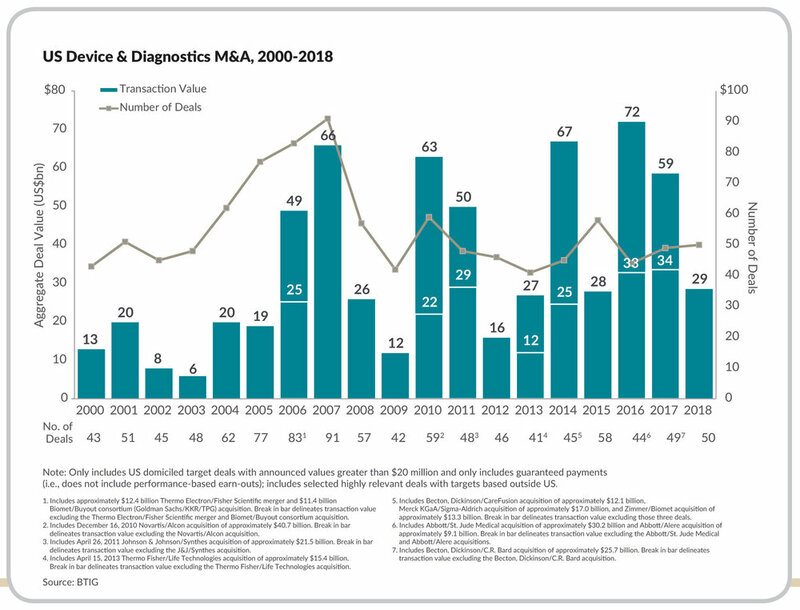 In 2018, medtech and diagnostic M&A was a mixed bag. Dealmaking continued at a steady rate—there were 50 deals in 2018 compared with 49 in 2017—but aggregate deal value dropped (see figure). One year doesn’t make a trend, but the decline in valuation is notable as that number had increased steadily in each of the preceding five years. It is also potentially worrisome because it could be an indicator that the fears concerning the impact of the widespread recent consolidation leaving fewer potential acquirers may be coming to fruition (although for the first time in the past few years there was no major medtech acquisition in 2018). Mark Secrest, managing director of healthcare investment banking at BTIG, notes that a downside to many companies today being highly valued is that they then become very expensive acquisition targets. For example, he points to Abiomed Inc., which has recently traded as high as 164 times forward revenue. “These companies are fully valued, so there is no room for a take-out premium,” he adds. Secrest is not concerned that the drop in aggregate deal valuation reflects any level of disinterest in M&A among acquirers. “Companies are still looking for ways to grow their businesses through acquisitions as evidenced by last year’s solid deal count,” he says. One possible explanation is the reopening of the medtech IPO window, which provides a competitive alternative to being acquired. When there was no public market, the only option for companies that weren’t big enough or weren’t growing fast enough or were in markets that weren’t large enough was to be acquired because there was no credible alternative to finance business growth. That market dynamic creates pricing leverage for prospective buyers. But having a viable public market provides acquisition targets with leverage, and indeed we are seeing multiple companies pursue parallel tracks, exploring both potential acquisitions and IPOs. In Secrest’s view, the decision on which course a company pursues is largely driven by shareholder composition. For example, if a company is fully institutionally-owned and an earlier realized return would be important to those investors, then pursuing a parallel track strategy would make sense. Older PostS2E4: 'Meet the Innovators' - Sahil Diwan, Co-founder and CEO, SafKan Inc.